Maximise your marks for every answer you write with Law Express Question and Answer. This series is designed to help you understand what examiners are looking for, focus on the question being asked, and make your answers stand out. See how an expert crafts Answers to up to 50 questions on [title]. Discover how and why different elements of the answer relate to the question in accompanying Guidance. Plan answers quickly and effectively using Answer plans and Diagram plans. Gain higher marks with tips for advanced thinking in Make your answer stand out. Avoid common pitfalls with Don’t be tempted to. Compare your responses using the Try it yourself answer guidance on the companion website. Practice answering questions and discover additional resources to support you in preparing for exams on the Companion website. 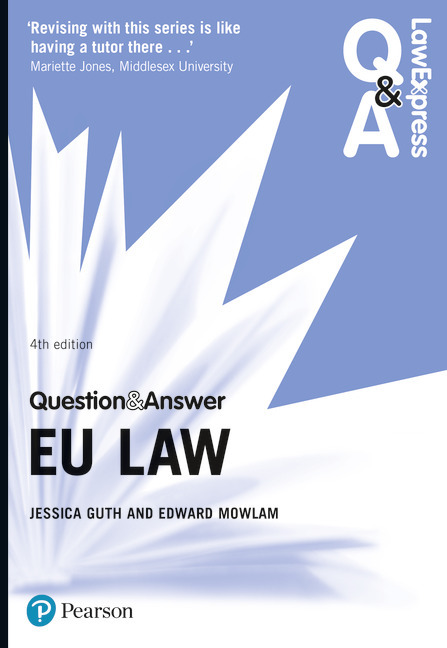 See how the experts craft Answers to up to 50 questions on EU Law. Discover why elements of the answer have been included and how they relate back to the question in accompanying Guidance. Plan answers quickly and effectively no matter what your learning style using Answer plans and Diagram plans. Gain even more marks with tips for advanced thinking in Make your answer stand out. Compare your responses with that of the answer guidance on the companion website with Try it yourself. Jessica Guth is Senior Lecturer, Leeds Beckett University. Edward Mowlam is Lecturer in Law, University of Bradford.